Click here for product uses, reviews, safety info. Place your order with us online or talk to an expert right now. Garon Guard™ provides thick protection, 5 - 6x thicker than retail paint products. Garon Guard™ is easy to apply with your own staff. Just mix, pour and apply by roller. CLICK ABOVE to see Garon Guard™ in action! No primer needed--a cost and labor savings. Because of its low odor, Garon Guard™ may be used in food production areas without shutting down. The ideal industrial epoxy coating. Resists abrasion, water, acids and solvents. prevents further deteriation of concrete slabs. 200 sf. per kit at 12 mils. 400 sf at 6 mils. @ 70F: Light traffic: 16-24 hours. Premeasured components in a 1.5 gal kit for easy application. Components include: 1 gal Part A (resin), 1/2 gal Part B (hardener) - volumes approximate. Garon Guard™ is approved for shipping to all 50 states by ground or air. How thick is Garon Guard™ compared to paint at the hardware store? Garon Guard™ is an epoxy composite designed for heavy industrial and comercial use. The thickness at 12 mils is 6-12 times thicker than ordinary latex, water-based and solvent based coatings. 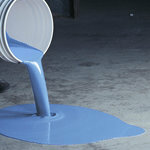 Usually, regular store bought coatings and paints range from 1 mil to 3 mils. How many coats of Garon Guard™ are required? You can apply as many coats of Garon Guard™ as needed depending on how porous the concrete slab is. Garon Guard™ is designed as a self-priming one coat application. Usually 2 coats of Garon Guard™ is the maximum needed in most applications. Does Garon Guard™ need to be top-coated? Garon Guard™ can be top coated but it is not required. For added chemical resistance you can top coat Garon Guard™ with our Hi-Gloss™ or Hi-Gloss™ High solids. Garon Guard™ is not slippery in dry areas. It actually has more traction than an uncoated concrete slab. In wet areas, the addition of Garon Grit™ 240 can be added to Garon Guard™ for added traction. Rave Reviews From Sysco, Nascar, Tyson Foods and Many Others! "Your floor specialist was friendly, professional, and we got all the info we needed fast. Thanks!" "Your floor specialist was very knowledgeable with regard to your products and applications"
"Service was greate. Looking forward to continue buying more products from Garon." "We were able to patch holes in the threshold of the doorways to our freezers and coolers without shutting down to warm up the areas."